Are Orthotics What I Need? Many people come into the office and ask about the over the counter inserts. Now, I am not saying there is not a place in the spectrum of foot treatment for these inserts but there is a HUGE difference between over the counter inserts and custom made orthotics. To understand the difference it is important to understand why we need them! 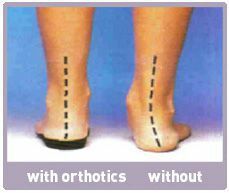 To start there are two types of orthotics, FUNCTIONAL and ACCOMMODATIVE. In addition, the approach to orthotics varies depending on the patient's foot type, age, and activity level. In general, functional orthotics are made to control motion in the feet, therefore increasing stability and decreasing damaging forces from improper biomechanics. Furthermore, because of the control that functional orthotics exert on the biomechanics of the foot, functional orthotics are often a mainstay in conservative treatment plans to prevent progression of deformities and to maintain correction postoperatively. Accommodative orthotics, unlike functional, are better for patients with rigid foot types and extreme deformities that must be offload. Accommodative orthotics help prevent and heal ulcerations that are caused by pressure. Now, back to the original question, why would you want to invest in a custom orthotics versus an over the counter insert. Over the counter inserts must be replaced every 4-6 months when you add this up over a lifetime you will be paying far more than you would for a custom orthotic and getting minimal benefit. Furthermore, over the counter inserts are basically just a cushion or pillow for your feet, not addressing the source of your pain. Custom orthotics are made for each person individually. They are not just a cushion like the over the counter inserts. Custom orthotics address a problem in your foot and fix it. If you want to know if custom orthotics are for you make an appointment today!